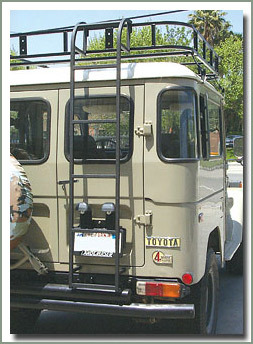 Wilderness Heavy Duty Roof Racks are manufactured from 3/4 inch heavy wall square steel tubing. 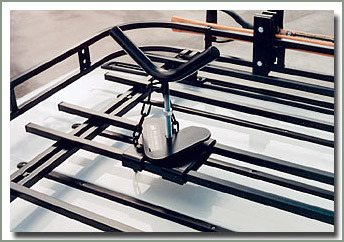 Racks come complete with all mounting hardware, easy to follow instructions and require only basic hand tools for assembly. 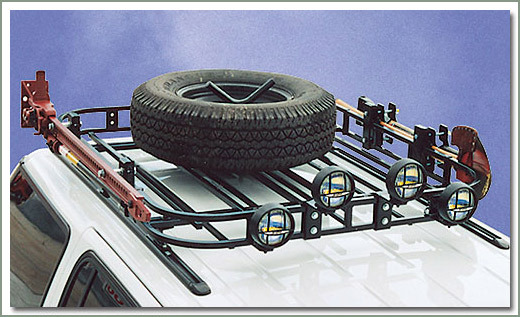 Each rack is custom designed to specifically fit your vehicle. 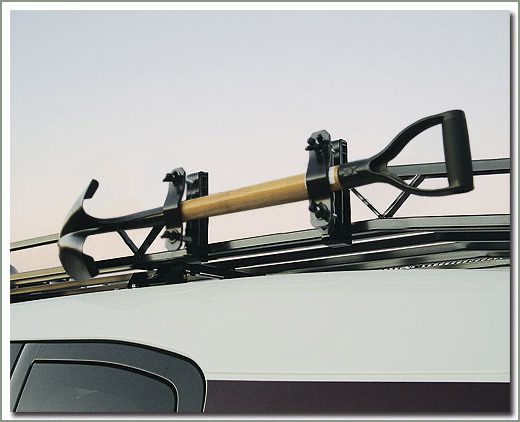 No more wondering if a universal rack will fit your vehicle. 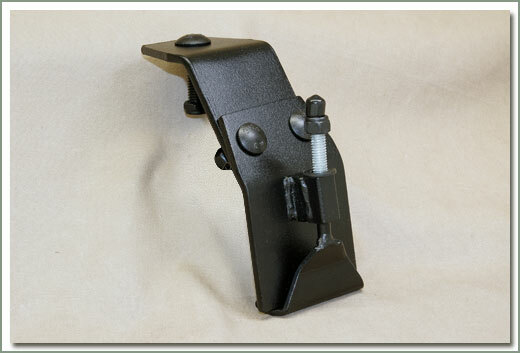 Black powder coated for a durable, long lasting, and attractive finish. All hardware is grade 5 and zinc plated for extra protection. Racks are available with 4 inch or 6 inch high sides. 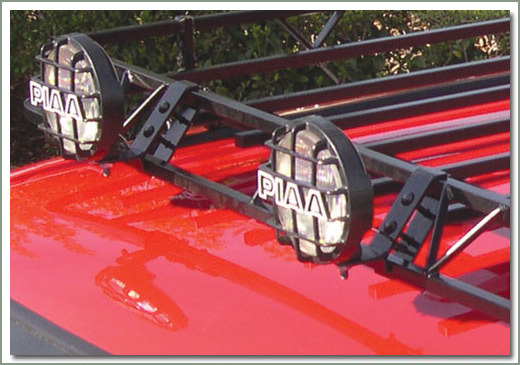 Heavy duty double rack end cross bar system provides support for the optional floor kits. 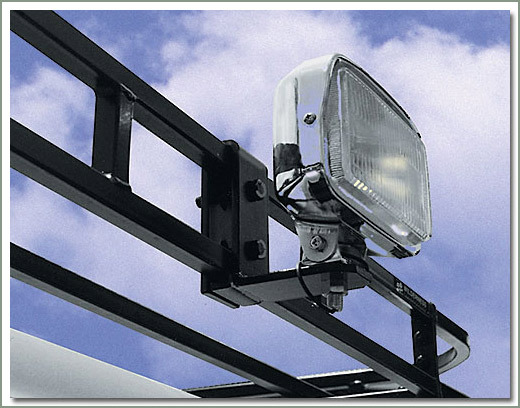 All bolt together design for simple installation and UPSABLE oversized shipment. 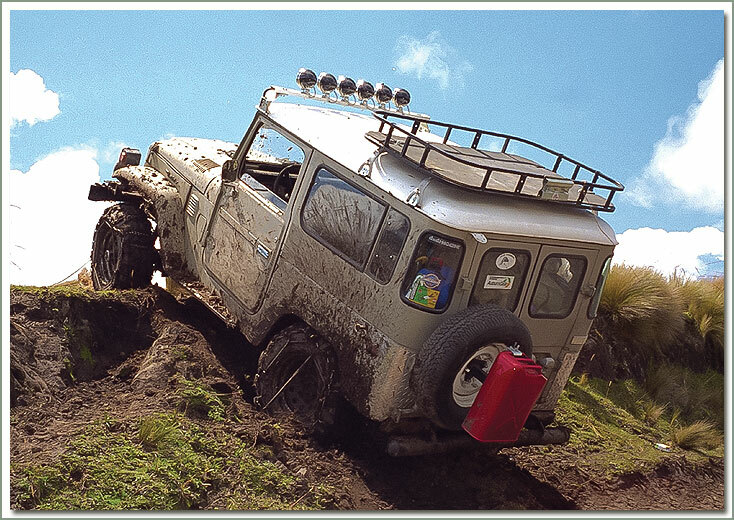 Wilderness racks are made for the ultimate off road vehicle! 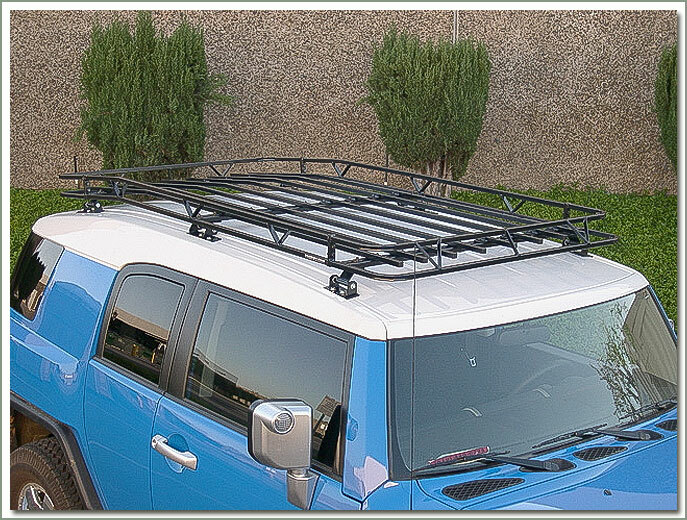 Do you have a Softop, Bikini Top, Summer Top® or no top, but still want a roof rack? 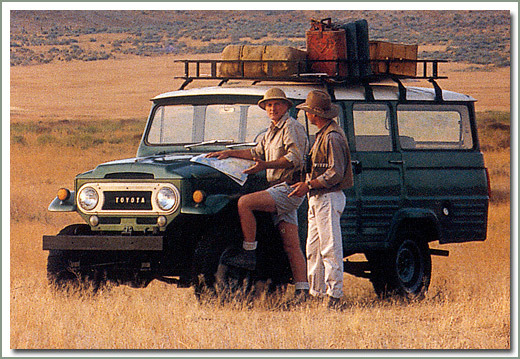 Then Specter has a roof rack for you which is designed specifically for those 40 Series using a Softop, Bikini Top, SummerTop® or no top at all. 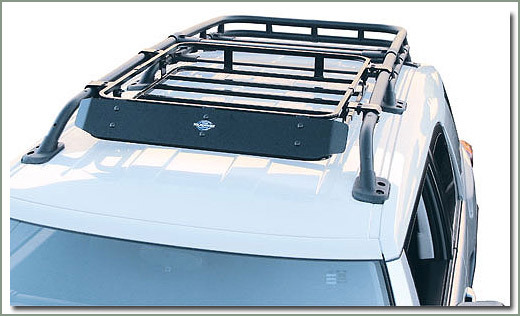 See #258-100 for the Expedition Roof Rack. Also pictured is #255-40 Swing Out Tire System). 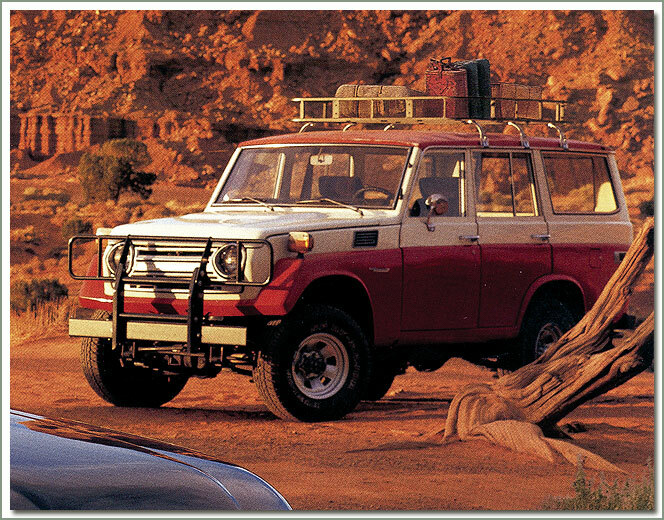 40 Series Expedition Rack (see page 258). 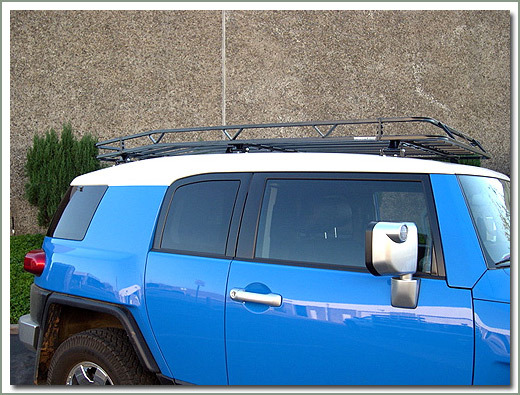 Fits 2006 and later FJ Cruiser giving you an extra level of storage inside the rear area - Utility Rack mounts on top of the wheel wells and to the side panel tie downs - No drilling is required for installation - Once the rack is installed, you still have access to all the factory storage cabinets - rack is black powder-coated for lasting durability - Utility Rack is not compatible with factory sub-woofer - 44.5 inches wide by 23 inches deep by 4 inches high. 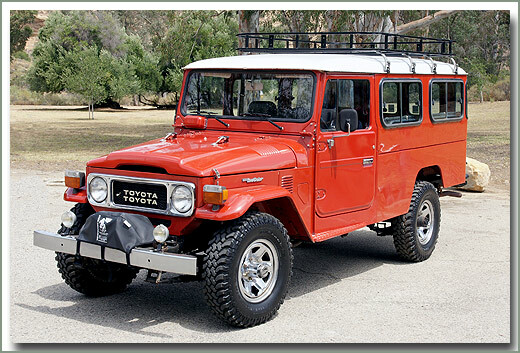 Fits 2006 & Later FJ Cruisers. 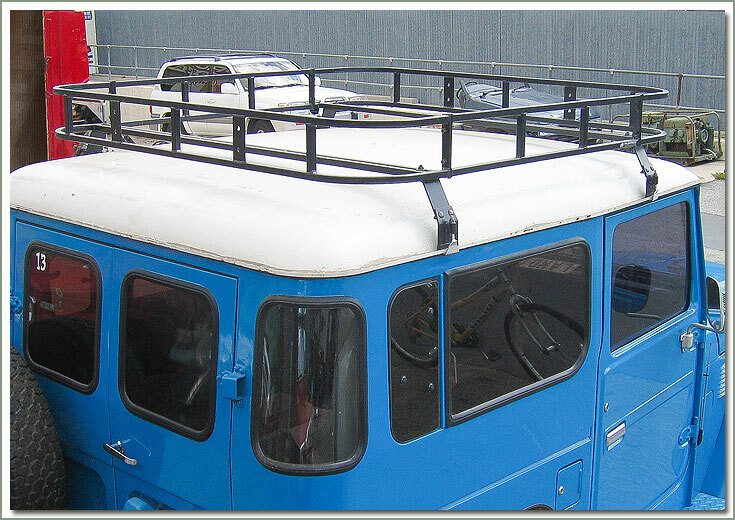 Mounts to existing holes in the roof of the hard-top, with no drilling required for installation. Made from heavy duty 3/4 in. square steel tubing, 300 lbs capacity. Measures 48 inches by 90 inches by 4 inches high. UPSable. 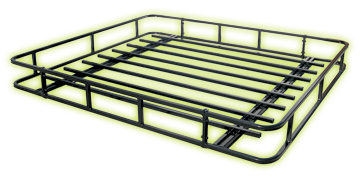 The tubular steel floor kit is manufactured from 3/4 inch square tube and has fully adjustable spacing to provide more equal weight distribution throughout the rack. Includes mounting hardware. Black powder coated finish. 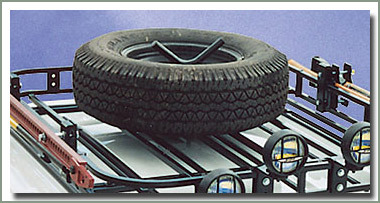 The steel flooring is required when installing the tire bracket, see #256-300. 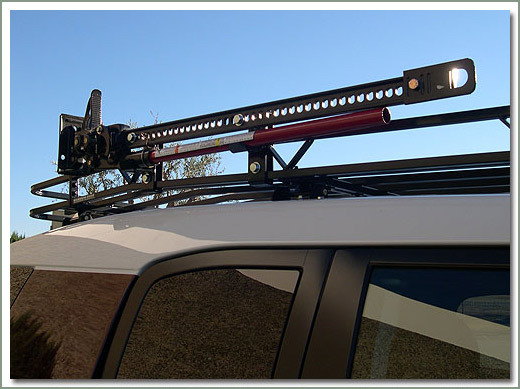 Wilderness Roof Rack Ladder hooks over rack side allowing easy access to the items stored in the rack. Constructed of 3/4 inch square steel tubing. Includes mounting hardware. Black powder coated finish. Ladder is not designed to be permanently attached. 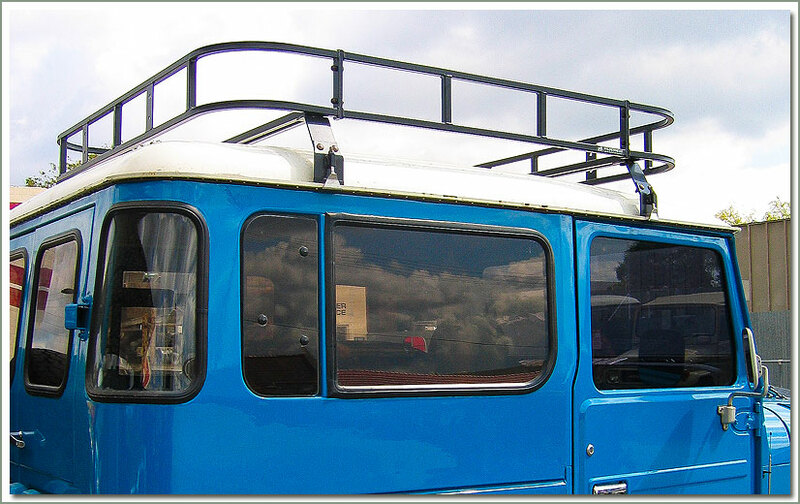 These clamps are original replacements for the Heavy Duty Roof Racks. They are available in 2 sizes, 5-inch and 7-inch. 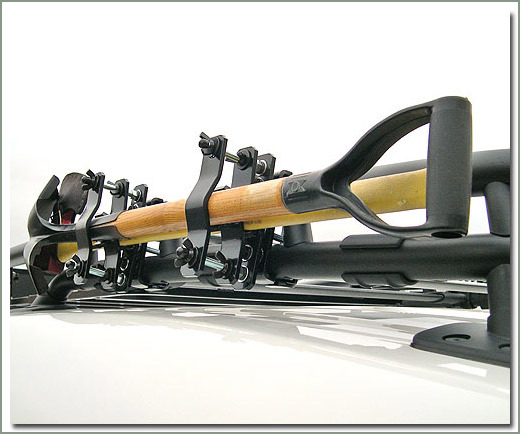 The 5-inch clamps fit Roof Racks #256-87, #256-88, #256-89, and #256-91. 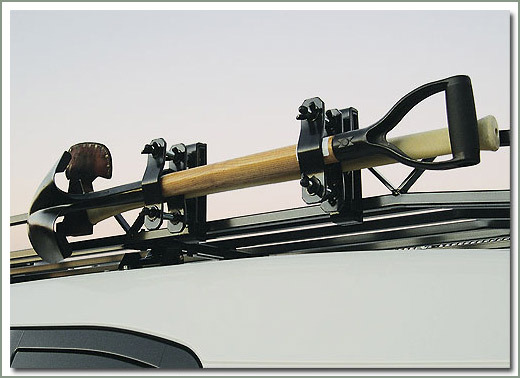 The 7-inch clamps fit Roof Racks #256-83 and #256-85. 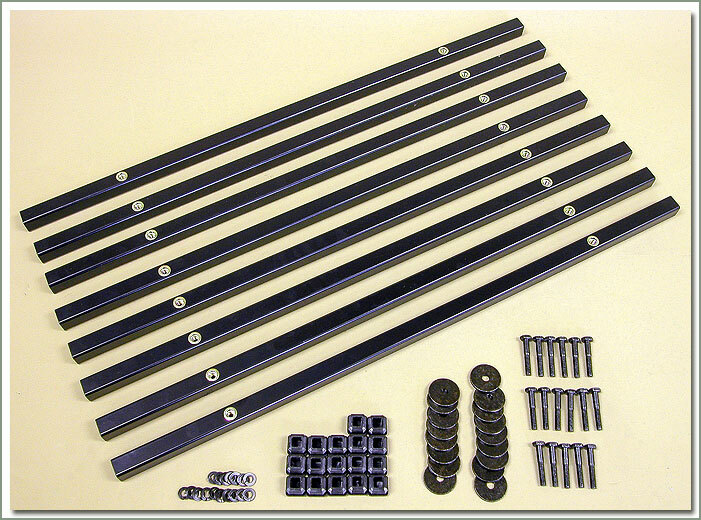 5 inch - Black powder coated finish - Fits #256-87, #256-88, #256-89 and #256-91. Sold each. 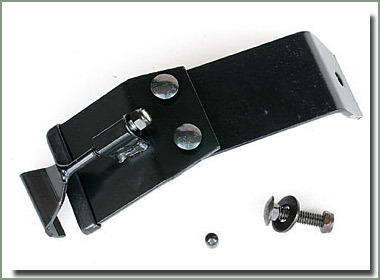 7 inch - Black powder coated finish - Fits #256-83 and #256-85. Sold each. 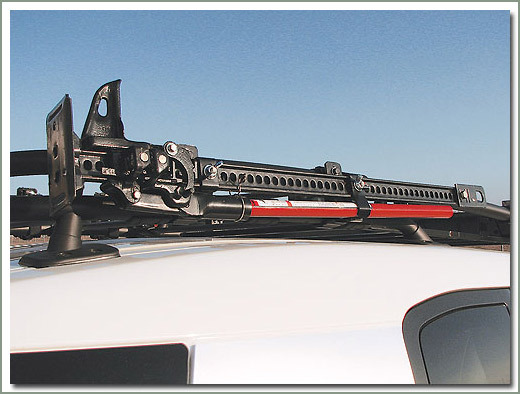 Spare tire bracket allows you to carry a spare tire in your roof rack. 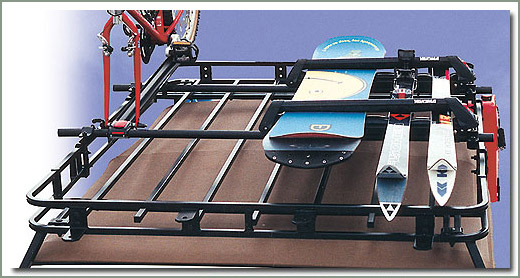 Bracket mounts to Wilderness’s roof rack floor. 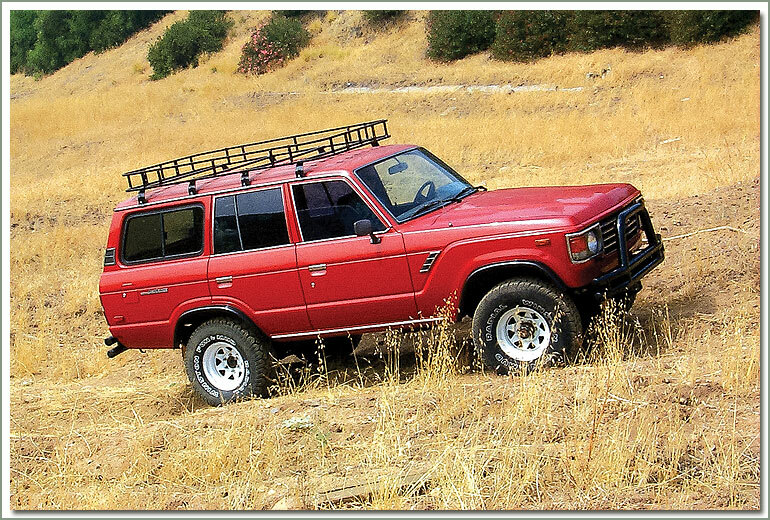 Fully adjustable to fit all types of rims & tires. Includes mounting hardware. Black powder coated finish.